When the Kobo e-reader first appeared, its very affordable price point of $149 made it an attractive proposition. It's been a few months, however, and the market is ever-more crowded, with both dedicated e-readers as well as multi-taskers (such as the iPad) moving into the space big time, and there are also plenty of similarly priced options, including the WiFi version of the Nook. In fact, almost anything qualifies as an e-reader these days -- but there's still room for a thin, light dedicated device that reads books in an enjoyable way for an affordable price... or at least that's the story that Kobo is trying to tell. We've spent the last few weeks reading with the Kobo, with the main goal being to find out if the simple device has enough features to contend with the host of options (and price points) available to consumers today. Read on for our thoughts. Despite being a "cheap" e-reader (more on what that means in practice below), Kobo's device is, in practice, pretty awesome feeling. 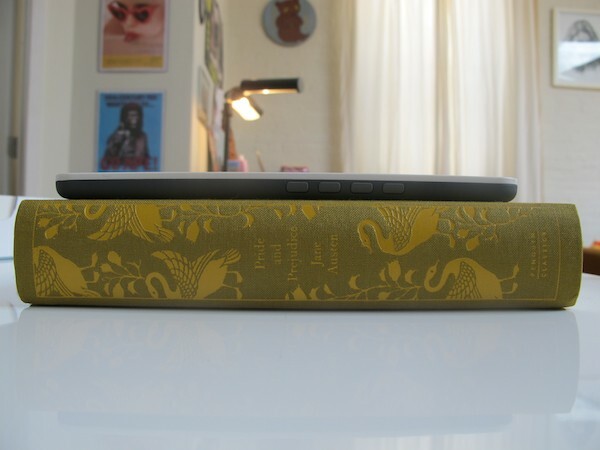 No, it doesn't feel as substantial as the much heavier Nook, but that is actually a good thing, it turns out, because the device is so comfortable to hold in the hand -- an experience we've always found lacking with the Nook, and, to a lesser extent, the Kindle. The rubbery "quilted" back is tacky enough that you can hold the 6-incher comfortably with just one hand, a move we've never perfected with the Nook, Kindle 2, or iPad. The large blue d-pad for paging is a little bit mushy for our tastes, but it certainly gets the job done, with very few accidental key presses -- always nice to see. The only other buttons on the Kobo -- Home, Menu, Display, and Back, are seated nicely on the left-hand side of the device. It's very bare bones, but there's really nothing to complain about. The display is something of another story. While its an e Ink-er, meaning that reading on it is, generally, pretty fantastic, the Kobo's lack of built-in screensaver has caused our unit to already have a fairly noticeable "burned in" home screen -- something we find to be pretty annoying. But more on the display in a moment. Ultimately, the Kobo's hardware is actually more enjoyable to use than many other e-readers we've run into: its simplicity and lack of features is actually its strong point, because holding the device is the closest thing to the experience of holding an actual book or magazine that we've encountered. The relative lack of elements for your hand to encounter while holding the unit -- for instance, there's no headphone jack... because there's no media player -- make it smooth and easy to grip whether you're curled up on the couch or laying on your back across your bed, and you don't have to fear dropping it on your face (as we often have with the iPad) because, even if you do, it's unlikely to do that much damage. The Kobo e-reader has 1GB of storage (plus an SD card for more), which means you can house about 1,000 books in it, and it comes pre-loaded with 100 classics. While that sounds great on the surface, and surely will be for some buyers, we're actually not huge fans of Gutenberg e-books in practice, but this could just be us: we'd prefer to pay $5 - $10 for a copy of Sense and Sensibility with great formatting. But for most, the wide selection of pre-loaded classics is a nice touch -- especially since there's no internet connectivity here, and the only way to get selections onto your device is by USB connection to your computer. That's a huge drawback, to be sure -- but back to the reading experience. The e Ink screen is very simple, but very enjoyable to read on -- regardless of your lighting situation. e Ink continues to be the standard in e-reading, and it's the option we prefer. Page refresh rate on the Kobo is slower than we'd like. It's slower than the Kindle and the iPad, and slower than the Nook has been in our experience since the 1.4 firmware upgrade (unfortunately, our Nook unit is having some major performance issues right now, i.e., it appears to be dead, so we couldn't test them against each other). This is one place where we continue to have issues with e-readers: in the time it takes to turn a page, maybe your mind thinks a bit on what it's just read, and regardless, that behavior is so ingrained you barely notice it. With an e-reader, you make a decision to hit that button, and then -- lag -- wait for the page to "turn." It is an experience-breaking lag we really wish wasn't there. Other than that, the Kobo runs quite smoothly -- after all, there's really nothing going on, so you'd expect the device to be without hiccups, and it is. 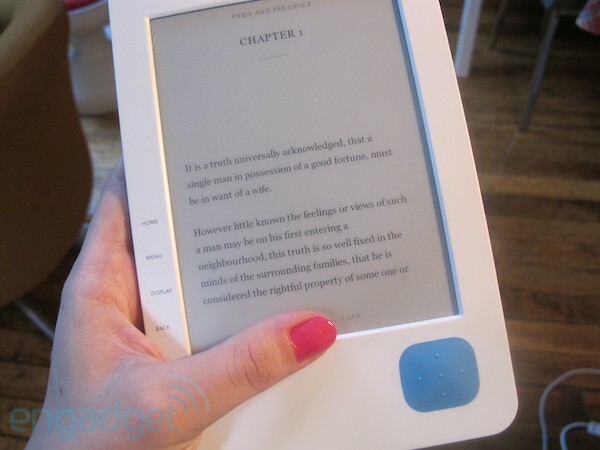 Kobo proclaims that its reader gets about 2 weeks on a single charge. We haven't had our unit quite two weeks, but we've only charged it once and it's still hanging on with well over half of its life remaining. Whereas battery life on devices such as the iPad or Nook can be annoying, the Kobo's simplistic list of functions -- it really only reads -- again stands it in good stead here. Overall performance-wise, books can take longer than we'd like to see to load up, though when it wakes from sleep, it reloads the page fast enough to satisfy us. The process of software updating was also not without its annoyances -- a complicated series of simultaneous button presses (three of them! with two hands!) meant that we had to try several times before we got the reboot to take effect, but once we had that accomplished, the update proceeded without headache. E-readers these days are defined by their features, meaning, essentially: 'what do they do besides books?' By that metric, the Kobo doesn't fare well: it's got no internet connectivity, no media player, a relatively small storage space (both the Kindle 2 and the Nook boast 2GB), and no browser (because there's no internet!). That said, a lot of readers which do boast features like browsers aren't doing so very successfully, and for this bargain barrel price, we're just as happy to not have one. After all, the point is to read, right? At the end of the day, if you're an avid reader looking to shell out a relatively small amount of money, you might not care about listening to Nine Inch Nails while you browse the pages of 20,000 Leagues Under the Sea (seriously, who does that?!). The Kobo store, in conjunction with the Borders e-book store, offers a pretty massive collection of over 1 million titles, so nearly any reader will be satisfied, with plenty of new bestsellers coming in at around $10 -- a price which we have no problem with. Bluetooth syncing with mobile devices (Kobo's launched e-reader apps for most platforms) is a nice touch for the reader who must read wherever they are. Here's the thing: the fact that the Kobo e-reader isn't a multitasker like the iPad and newer "hybridized" devices might not signal its failure in any way. In fact, its single-use is justified by its price. Is it the best e-reader we've ever used? No -- like we said, its page-refreshes are a little slow, and for a device that's all about the business of reading, that's no small thing. And, as we mentioned at the beginning, the e-reader market is increasingly filled with similarly-priced options, many of which boast more features. Still, we can say pretty firmly that its thinness, lightness, and comfort in the hand is far and away its strongest feature, and one that it beats a lot of its more robust competition prettily handily. So, if the Kobo reader isn't quite the future of reading devices, it's certainly firmly entrenched in the present, with enough likeable qualities at a price point that few could argue with, to keep it on our list of readers we wouldn't mind spending a night at home curled up with on the sofa, reading Wuthering Heights while our significant other plays Red Dead Redemption.